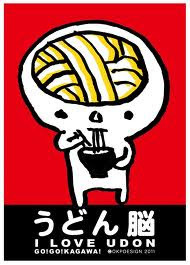 Udon ken うどん県　”Udon noodles prefecture"
The new mascot has noodles in its brain . . .
CLICK for more udon no business ideas ! Udon no debuted Monday as the mascot of Kagawa, which has been billing itself as "Udon Prefecture" since last fall. 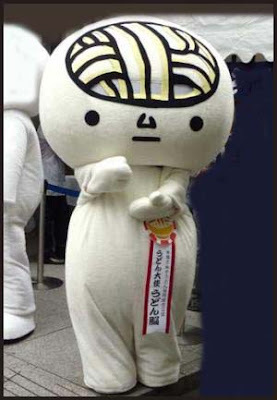 The noodle-brained mascot will be used to help promote Kagawa as the kingdom of the wheat-flour noodle. "I am the same (as the character) in that the only thing in my brain is udon,"
said Shigeki Omine, chairman of the association. olive cider オリーブサイダー from the juice left over after pressing. The Winner was 530 kg in 2008.
still made by hand in many family enterprizes. ishikirizushi ishikiri sushi 石切ずし "stone cutters sushi"
From Shodoshima. The stones of this island were cut and transported to Osaka for the construction of Osaka Castle. Now this famous sushi is prepared for festivals or memorial services. of the stone mason . . .
every family has its own box, like the ROKUBEN. They grow in many parts of the prefecture since the Edo period. kintokimame, nimame 煮豆　"beans to be boiled"
They are often prepared with sugar coating for amanatto 甘納豆 sweet natto. from the Toodai-ji Temple of Nara, here for more than 400 years. with the landscape of Ritsurin Park made by ebi and nori.
. . . CLICK here for 志満秀 Photos ! source : www.shimahide.com/ Details about the making. An old grandmother wanted to give some food to the pilgrims as osettai. She roasted some broad beans in an earthen pot (hooroku). Some fell off and into a pot where she had kept a bit of soy sauce. She picked these beans out after a while and ... whow, they tasted really good and soft! 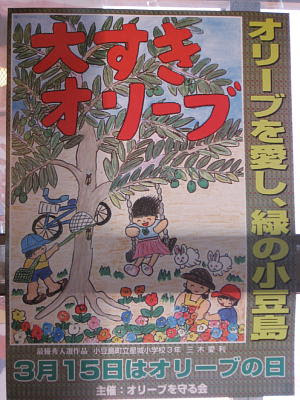 Thus these beans were born.
. Sanuki Udon Poster in English . Named after the famous Shikoku pilgrimage, Henro. On June the second, the day of udon, many udon-makers bring their special sanuki udon to the shrine Nakano Tenmangu 中野天満宮 / 滝宮天満宮 in Takamatsu. They also hold the Sanuki Udon Festival さぬきうどん祭り.
. . . the prefecture, which has been promoting itself as “Udon Prefecture” since 2011, had something of a damper Tuesday when it announced a halt to sales of a new product to popularize the noodles in the rest of the country. 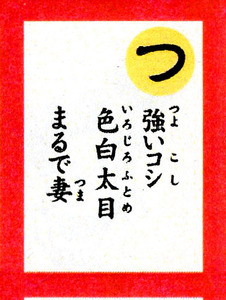 One of its “Udon Karuta” playing cards for the New Year was feared to be politically incorrect. each bearing a poem on the theme of udon, were released by the prefectural government on Saturday after soliciting submissions of such poems from across Japan. is a poem in traditional haiku mode intended to celebrate Kagawa’s famous Sanuki udon noodles. Koshi is a Japanese word for the “crunchiness” of noodles but as it can also be taken as referring to a person’s “hips” the poem was deemed potentially offensive to women. ..... The government of Kagawa had prepared 2,000 sets of the cards for sale. Sanuki udon are served for the ceremony when a new home is finished. It is customary that the people of the new home and the visitors sit in the new bath (ofuro) and eat the noodles there in the water. Yes. And also if someone makes a renewal of his bathroom only, this eating in the water takes place. futoku, nagaku ... for the new situation, may it be long and good. are eaten in the full bathtub. table mark テーブルマーク Table Mark. specializing in frozen food, located in Kagawa. prepared for the summer festival to entertain visitors. The bones are soft and can be eaten too. dashi, carrots, shiitake mushrooms, mirin, soy sauce and mochi make this dish. with iriko and chirimenjako, flavored with vinegar miso. After the field work is done, the dojoo are fat and ready to eat. Prepared with thick udon noodles and vegetables. Best eaten with all together. Best made in the cold months of November till March. Prepared with a simple broth. This is a special green leaf vegetable of Kagawa prefecture,the naming is of Western Sanuki. It is quite bitter and needs to be soaked in water over night to get rid of the bitterness (akunuku). It can then be prepared like hakusai or komatsuna leaves. also with dengaku miso or nigorogashi. The octopus is fresh from the Inland Sea. This dish combines the bounty of the mountains and of the sea. from katakuchi iwashi (anchovis). The fish are boiled for a moment, then dried and later added when the rice is cooked or mixed to the finished cooked rice . Prepared in large amounts to last for a few days, with a lot of salted fish. It is pressed into its form with a heavy hammer, hence the name imitating the sound "kan kan". Prepared from old family recipes. Especially eaten for the New Year, with the wish to work diligently (mame). manba is a kind of takana leafy vegetable. It is fried, abura-age and dashi are added. kenchan derived from kenchin けんちん【巻繊】 , the edges and fringes of leafy vegetables. nimono no tenpura 煮物てんぷら "
Leftovers from boiled vegetables are put into a coating and deep-fried again for another delicious meal up to three days after the first boiling. from fava beans and sawara. In some areas, the new bride of the home would prepare some with the flavor of her mother-in-law, take it home to her own family and show off with her new recipe. From the islands 女木島、男木島 near Takamatsu, where peanuts are planted. Prepared in autumn. Peanuts simmered in saltwater, added to the black beans for the New Year food. The soft skin is kept on the peanuts for extra nutrition. The final flavor comes with salt and sugar. Prepared in Western Sanuki. Black mullet is boiled, grated finely and poored over rice with wheat. Sometimes miso or dashi is used for flavor. Even in a "noodle country" like Sanuki, in the cold winter buckwheat noodles are eaten, because it warms the body. Fish dashi, radish, carrots, satoimo potatoes, aburaage tofu and other things are boiled together for a good broth. Prepared in the winter months. Vegetables of the season are boiled and thrown over the udon noodles. Some homes eat it instead of the "toshikoshi soba" on December 31 to pass over to the new year. sofuto toofu ソフト豆腐 "soft tofu"
made from kinugoshi, with a bit less water. sugatazushi sugata sushi 姿ずし "sushi keeping the form"
Prepared in Shodoshima island from summer to autumn. Freshly fished Horse mackerel is used. The stem of satoimo potatoes is called suiki. It is soft and not too bitter. Served for the autumn festival to thank for the harvest. Prepared for the workers when they came back home after a working ship trip to Osaka. Takuan pickled radish is washed and dried, then fried in the pan with oil, soy sauce, mirin, chili peppers and so on. prepared from autumn to winter, after the busy farmers season. The fields are drained of water and the remaining fish are eaten. With white miso, sugar and a bit of vinegar and salt. Sometimes radish. Nowadays saba fish is used too. uchikomijiru 打ち込み汁 "soup with anything thrown in"
„Unsere Gegend ist sehr steil und wir haben nur wenig Platz zwischen dem Meer und dem Bergwald. Da wächst kein Reis. Wir machen fast alles mit Süßkartoffeln.“ Frau Murakami Kazue von der Halbinsel Mito schiebt ihren Schubkarren auf einem schmalen Pfad entlang dem Haus nach oben auf eines der kleinen Terrassenfelder, wo ihre Süßkartoffeln wachsen. Oben angekommen hockt sie sich erst mal erschöpft auf die Steinmauer, sie ist nämlich schon weit über 80 Jahre. „Ich habe das Leben und Kochen hier von meiner Schwiegermutter gelernt, aber meine Söhne sind in die Stadt abgewandert und ich hab keine Schwiegertochter mehr, der ich den Geschmack unserer Familie weitergeben kann. Ich bin hier die letzte der Familie“, klagt sie wie viele alte Bauern im ländlichen Japan. Dann beschreibt sie ihre Lieblingsgerichte mit den Süßkartoffeln. Für „Kankoro-Mehl“ werden die Süßkartoffeln in Scheiben von einem Zentimeter Dicke geschnitten und an der Sonne getrocknet, dabei hilft im Winter der kalte Wind vom Meer und die Scheiben rollen dabei hin und her mit dem Geräusch koron koron ... daher der Name. Die getrockneten Scheiben werden im Steinmörser zerrieben und das Mehl für verschiedene Speisen verwendet. Weil auch die Schalen mitgetrocknet werden, bekommt das Mehl eine etwas braune Farbe. Für die „Kankoro-Nudeln“ wird 70% Mehl von den Süßkartoffeln mit 30% Weizenmehl vermischt und daraus Nudeln geknetet. Die Dashi wird aus kleinen Sardinen gekocht. Die von Hand geschnittenen dicken Nudeln werden für eine einfache Mahlzeit in eine Schale gelegt, mit der Dashi übergossen und mit etwas geriebenem Ingwer und klein geschnittenen Frühlingszwiebeln gewürzt. Aus dem Kankoro-Mehl werden auch kleine Bällchen (kankoro dango) geformt, die oft noch den Abdruck von Mutters Fingern haben und als kleiner Imbiss am Nachmittag beliebt sind. Die Ranken der Süßkartoffeln liefern ein süßgesimmertes Gemüse (tsukudani) für die Inselbewohner. Sie werden mit Sojasauce und Kombu eingekocht. Tsukudani dieser Art mit verschiedenen anderen Zutaten ist seit 1945 eine Spezialität von Shoodoshima und es gibt einige Hersteller mit eigenen Rezepten, die noch von Hand einkochen. Ausgesuchtes Kombu von Hokkaido und Seegras von der Inlandsee werden mit der einheimischen Sojasauce eingekocht. Dabei müssen sie die Zutaten in den großen Töpfen mehr als zwei Stunden mit einem besonders langen Spatel umrühren. Die Inselbewohner essen ihr Tsukudani nicht nur auf Reis, sonder auch auf Toast, ganz moderne sogar auf einer Lage mit Käse oder Mayonnaise. Die Sojasauce von Shoodoshima hat eine Geschichte von mehr als 400 Jahren; sie wird auch heute noch in Familienbetrieben überwiegend von Hand in großen hölzernen Fässern zubereitet. Die Hersteller entwickeln neben den traditionellen Sorten immer wieder neue Geschmacksrichtungen, um sich an die Wünsche ihrer modernen Kunden anzupassen. Selbst Pudding mit dem Geschmack von Sojasauce wird angeboten und von den Kindern mit großem Vergnügen verspeist. Die Herstellung von langen dünnen von Hand ausgezogenen Weizennudeln (tenobe soomen) begann bereits im 16. Jahrhundert und hat bis heute nichts an ihrem traditionellen Geschmack verloren; sie werden hier einfach „Nudeln der Insel“ (shima soomen) genannt. Im Winter haben die Bauern Zeit genug, um die Nudeln sorgfältig mehr als zwei Tage lang von Hand auf lange Stäbe zu reihen und langsam zu strecken. Ein Bündel Shoodoshima-Soomen wiegt nach altem Brauch etwa 50 Gramm und enthält 320 bis 350 Nudeln von 19 Zentimeter Länge. Gegessen werden sie hier noch nach der Tradition aus einem großen Holzbottich, im Sommer im kalten Wasser schwimmend, im Winter in heißer Brühe. Alle kommen zusammen und stecken ihre „tausend Essstäbchen“ (senbonbashi) in den Bottich, streiten sich lachend um gleichzeitig gemeinsam ergriffene Nudeln und stärken so die Bande der Gemeinschaft im Dorf. Shoodoshima wird auch die „Insel der Oliven“ genannt. Die ersten Olivenbäume kamen 1908 aus Amerika und der Anbau im Dorf Nishimura begann bald in großem Rahmen, da sich das milde Klima und die relative Trockenheit dieser Gegend für die Pflanzen als günstig erwies. Olivenöl für kosmetische Produkte und für die Küche als Tempura-Öl gibt es in einigen Variationen, aber darüberhinaus haben die Inselbewohner auch ihre eigenen Produkte entwickelt. Schokolade mit Olivengeschmack und Oliven-Brauselimonade (oriibu saidaa) sind begehrte Reisemitbringsel, während die Oliven-Eiscreme am besten frisch auf der Insel schmeckt. Jedes Jahr im Herbst findet das „Fest der großen Kürbise“ (kabocha taikai) statt, bei dem der schwerste Kürbis einen Preis bekommt. Alle Bauern aus der Umgebung und aus vielen anderen Teilen Japans reisen mit ihren dicken Kürbisen an, tauschen Hinweise zum Anbau aus und wiegen die dicksten. Im Jahre 2008 gewann Hase Kazushi aus der Präfektur Toyama mit einem 530 Kilogramm schweren Prachtstück. Diese „Monster-Kürbise“ (o-bake kabocha おばけかぼちゃ) werden im allgemeinen nicht gegessen. ***** . Folk Toys from Kagawa . This hokku is from the end of the tenth month (December) in 1816, when Issa was traveling in the area just east of the city of Edo. In one local mountain quarry work goes on even on winter evenings, and the continuous sound of metal tools hitting against the rock of the mountain make the clear, hard winter moon, too, look like a cold rock. The hokku alludes to one of the most widely known Japanese folktales, "Mount Kachikachi," in which a rabbit and a raccoon dog (tanuki) engage in a fierce struggle. Like some of the original Grimm's tales, this Japanese folktale has many variations, and most contain violence. In the most famous scene -- known to almost all Issa's readers -- the rabbit rides on a bundle of firewood carried by the raccoon dog on his back and begins to strike two stones together to light a fire. Hearing these steady hitting sounds (kachikachi), the raccoon dog asks the rabbit what the sounds are, and the rabbit tells him that they are crossing Mount Kachikachi (Mount Hitting Sounds) and the sounds are simply the sounds the mountain. The rabbit continues to strike stones together and sets the bundle of firewood on fire, causing the raccoon dog to suffer burns on his back. Issa seems to be reminded of this violent folktale when he hears stonecutters on a mountain. The mountain itself is gradually being destroyed by human technology; it has literally become Mount Hitting Sounds, thus giving a new meaning to the mountain the rabbit mentions in the folktale. The repeated sharp, hard sounds made by the stonecutters seem to synesthetically hit even the moon. For the reference to the Mount Kachikachi folktale, see Maruyama Kazuhiko, Issa Shichiban nikki 2.275.